The first Saturday of the 2019 MLB season is loaded with intriguing matchups, including Game 3 of an early NL Central showdown as the Milwaukee Brewers host the St. Louis Cardinals. 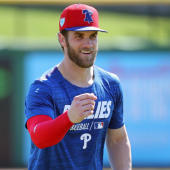 Elsewhere, Bryce Harper and the Philadelphia Phillies resume their series with the rival Atlanta Braves, and the defending World Series champion Boston Red Sox, who won on ninth-inning heroics Friday night, visit the Seattle Mariners for Game 3 of their series. Every team is in action on Saturday, but data scientist Stephen Oh has used his advanced computer to reveal three MLB odds worth backing for Saturday. Before laying down your own MLB picks, you should hear what he has to say. The renowned co-founder of Accuscore, Oh uses a data-driven approach to crush sportsbooks. He raked in more than $1,100 to $100 bettors tailing his MLB picks in 2018. The key to the success: Oh's projection model simulates each game 10,000 times, identifying critical trends and matchups that will make the difference -- and he shares the results exclusively at SportsLine. Parlaying Saturday's three MLB picks would pay out more than 6-1. We can tell you Oh is going with the Brewers (-132) at home against the Cardinals at 7:10 p.m. ET. He's hit on 15 of his last 20 picks involving St. Louis dating back to last season and is 3-1 on Milwaukee games. Oh knows that the Cardinals cruised to a 9-5 win at Miller Park on Friday night and were robbed of extra innings with a Lorenzo Cain catch over the fence to end Thursday's game, a 5-4 Brewers victory. But St. Louis can't rely on three home runs from Paul Goldschmidt as it did Friday. And Milwaukee had the National League's top homefield advantage in 2018. Starter Brandon Woodruff was strong the second half of the season and was a huge key to the Brewers' run to the NLCS. He also hit 99 mph on the radar in spring training. Meanwhile, St. Louis gives the ball to Dakota Hudson for his first career start. Last year, he didn't allow a single earned run at home in 14 relief appearances, but registered a 5.54 ERA in 12 road efforts. Oh's model has the Brewers winning in 61 percent of simulations. The implied differential of that number puts a fair money line spread at -156, giving Milwaukee considerable value. Oh's other MLB picks for Saturday include an underdog that's a must-back for any MLB parlay. You can only see which one it is at SportsLine. So which MLB picks should you make on Saturday for a huge 6-1 payout? And which favorite goes down hard? Visit SportsLine now to get Saturday's MLB best bets, all from the handicapper who returned a $1,100 profit on MLB picks last season.